Layoffs hit Activision Blizzard, Nintendo hosting a Direct presentation tomorrow, open beta for Tom Clancy’s The Division 2 starting at the beginning of March, free weekend for Rainbow Six Siege, Total War: Three Kingdoms delayed, short-film for Anthem debuting on Thursday, and new releases for the week. For a company like Blizzard Activision with games under its belt like World of Warcraft, Overwatch, and Call of Duty, you’d think everything would be secure over there. However, that does not appear to be the case. While things are FAR from dire, 2018 didn’t quite hit expectations. This was evident during the Activision-Bungie split as expectations were not met across the board for Blizzard Activision. Rumors of lay-offs last week were reported and during a conference call today, those layoffs were official. Activision Blizzard CEO Bobby Kotick stated during an earnings call that despite the company achieving record results in 2018, targets were not hit and thus projections for 2019 are being lowered. This also sees the company consolidating and restructuring as a result. The report on Kotaku does go on to state that the effected members will receive a “comprehensive severance package”, job placement assistance, career coaching, profit-sharing bonuses from the previous year, and continued health coverage. Activision Blizzard seems to care a lot more about the lost employees than Telltale did last year. As far as the number of staff laid off, it is only said to be eight percent. But when you factor in that Activision Blizzard had about 9,600 employees, that estimates to around 800 people without a job after today. Kotaku reports that sources have told them that layoffs have affected Activision publishing, Blizzard, King, and some of Activision’s own studios including High Noon. If the game industry is strong for one thing, it is coming together when times are bad. Gearbox and Relic Entertainment have announced that positions are available. Richard Oud, lead animator at Guerilla Games, and David Ellis of 343 also stated that their respective companies are hiring. It is hard to imagine that a company of Activision Blizzard’s size had to resort to layoffs. The earning report itself shows that the company is not struggling to make a buck, but this is a publicly traded stock. With the outcry on Diablo Immortal, Destiny 2 falling under expectations and then gone from the portfolio, what will 2019 have in store for Activision Blizzard? The first Nintendo Direct of 2019 is debuting tomorrow at 5:00 p.m. E.T./ 2:00 p.m. PT. Nintendo will be discussing upcoming Switch releases, including new information on Fire Emblem: Three Houses. Expect the video presentation to be around 35 minutes and lets hope Nintendo throws in a surprise or two. Not too surprising, Ubisoft will be hosting an open beta for Tom Clancy’s The Division 2 starting on March 1st and running through March 4th. 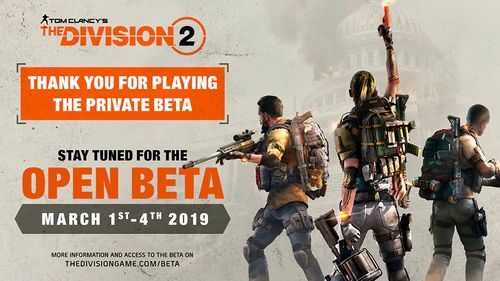 It seems likely this will be the same content offered in the private beta so those who have previously tried out The Division 2 might not find anything new here. Speaking of Ubisoft, Rainbow Six Siege is having a free weekend starting on Valentine’s Day, February 14th. The free play will then end on the 17th if you’re on PC and the 18th for PS4 and Xbox One players. This might be a good chance to jump in and give it a shot if you have not done so already. Originally scheduled to launch on March 7th, Total War: Three Kingdoms is moving its release date just a little bit. Creative Assembly is taking some more time to make sure things are right and will be releasing on May 23rd on PC. Anthem is quickly approaching and what better way to build the hype than a short-film based on the game? Neill Blomkamp, director of movies such as District 9 and Elysium, is bringing his own take of Anthem with Conviction, a story set decades before the events told in the game. The short-film debuts this Thursday on the Oats Studios’ YouTube channel. It might be worth checking out some of the other short-films on the channel such as the ADAM series.